Tissue Procurement: Human ACL and PCL is collected from cadaveric donors with no history of joint disease or arthritis within 48 hours of death. Proper consent and serological information is obtained on all specimens. Explant Processing: The ACL and PCL are aseptically dissected from surrounding tissues in the knee joint. The ligament is cut into small explants approximately 3mm in size. Around 48 explants can be generated from each the ACL and PCL for a total of 96 explants. Please note the sizes are estimated and it is recommended that wet weights be determined for normalization purposes. 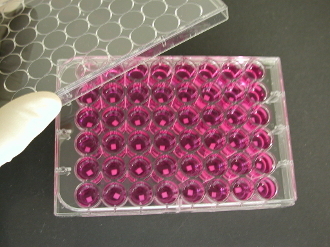 Explants are distributed into multi-well plates or in bulk format in media supplemented with 10% FBS. The cultures are shipped overnight with cold packs. Histology Service: A ligament explant will be formalin-fixed, paraffin embedded and sectioned into slices 5 microns thick. Two unstained slides and one stained with H&E will be provided. Additional shipping required.